Gathered in the Betsey Trotwood pub, there’s a springtime buzz of words: two groups of people united by a common passion seen from a different perspective. We were there – 26 and Letter Exchange – to pair a writer and a visual artist with a word. Make of that what you will. The pairs chose the words by sors virgiliana, a Latin method of augury adapted to today with the help of an Oxford English Dictionary into which a knife was inserted and pointed at a word selected by chance. There were some that immediately had a strange resonance while others were obscure enough to need study of the dictionary definition. ‘Dig’ seemed just right; ‘zaffre’ means what? It had been decided in advance that Freda Sack and I would be paired and given all 26 words rather than one prime specimen. Freda and I met a week after the knife in a dictionary evening. We thought the café of the British Library would be a good place, especially as ten years earlier we had managed a similar project called 26 Letters that became an exhibition in this imposing building. So we talked; we looked through the words on our list and we discussed possibilities. Freda approaches words through typography, through their shapes and the meanings you draw from the look of them. I approach words through exploring their meanings and connections, trying to see if they point me in a direction, like lights in a dark wood. The word that gave me the sense of light was ‘connected’, representing the letter C on our list. The phrase ‘everything is connected’ came into my head and I suggested to Freda that I would try to write a poem incorporating all 26 words. So we went our separate ways until I had something to show. My favourite quotation is EM Forster’s “Only connect”. I need little invitation to connect words together but it’s not often that I do so from a pre-determined group of words. My first thought was to write a sestude, just 62 words. But the form is too short to incorporate all 26 words and still make sense. I wanted the poem to make sense not become nonsense verse. So I began writing, seeing which words seem to reach out and make connections. The word ‘dig’ suggests archaeology. We have three words – Scythic, Yankton, Vinċa – that describe disappeared historic cultures. This stirs thoughts of the way we regard history. And the way we live in the present with links to the past and the future. So the first three-line stanza springs almost fully formed into my head and onto the page. The word ‘battement’ had originally puzzled me. It’s drawn from the vocabulary of ballet, and it’s about using your active leg to beat time while standing on the other, to be absolutely grounded in that moment. I liked the phrase “The battement of the present beats on”. It slid easily into the following lines about the future and the past. What is our attitude to the past? We try to preserve it and we also discard it, we treasure and ignore it; there’s a constant tension between opposite reactions. We have similar feelings around old, obscure words, the kind that are revived in this collection of 26. There’s almost a resentment of their obscurity – why are they withholding their meaning? At the same time there’s a desire to find out more, and this impulse seems more fundamentally human, more moral. And I realised that by we I meant we, the human race. There are strange words here that represent other times and cultures. Our incomprehension of the words is a sign of our disconnection but it need not be; we are connected, we are human. The words seemed to be making sense as I connected line by line. They all illuminate my theme, just by the possibility of making a connection from one word to the next. I got up to nineteen words used, and started to edit, rearrange words into stanzas. I made a list of the words that had not yet been used, ‘lino’ and ‘zaffre’ among them. Their meaning suggests a picture. And ‘hearse’ with ‘naviculoid’ has a similarly inevitable ‘inpouring’ of slow movement. There is a last line, a conclusion already waiting for me, in my end is my beginning, the first line is the last. The lines fall into stanzas of four lines, apart from the three-line opening. I realise that I’ve written 27 lines for the 27th poster. This seems meant to be. Everything is connected. When we met at British Library, we discussed two possible design routes – classical or experimental. Early on I decided that beautiful typography using a lyrical typeface was too obvious, maybe even limiting the potential to fully ‘connect’ or engage with the words. Conscious that the 26 pairs would each produce an individual interpretation of their specific word, the portrayal of all 26 needed a collective thread, as John’s poem had. Going ‘experimental’ had the possibilities to allow subtle references to this motif. My hope was to capture the ethos of connectivity, and to hint at the meanings of the various ‘given’ words. From my viewpoint, using one of The Foundry typefaces was another ‘given’. An early thought to use an old typewriter to create a poster, indirectly led me to the Foundry Dit typeface with its typewriter feel, which when overlaid gives an embossed effect rather like the ‘Dymo’ machine. The Foundry Dit and Dat families have a common horizontal-dash-grid structure, and were designed to work as a complimentary pair. Inspired by this serendipity, and John’s words ‘a bright image to say – everything is connected’, I set off to experiment with them. The collection of 26 disparate words are ‘this and that’ – the English meaning of Dit and Dat. Creating the poem and the poster we have made all the connections of meaning and form to bring ‘this and that’ together. When ‘set solid’, Foundry Dat’s inbuilt matrix aligns vertically and horizontally, forming a continuous pattern. 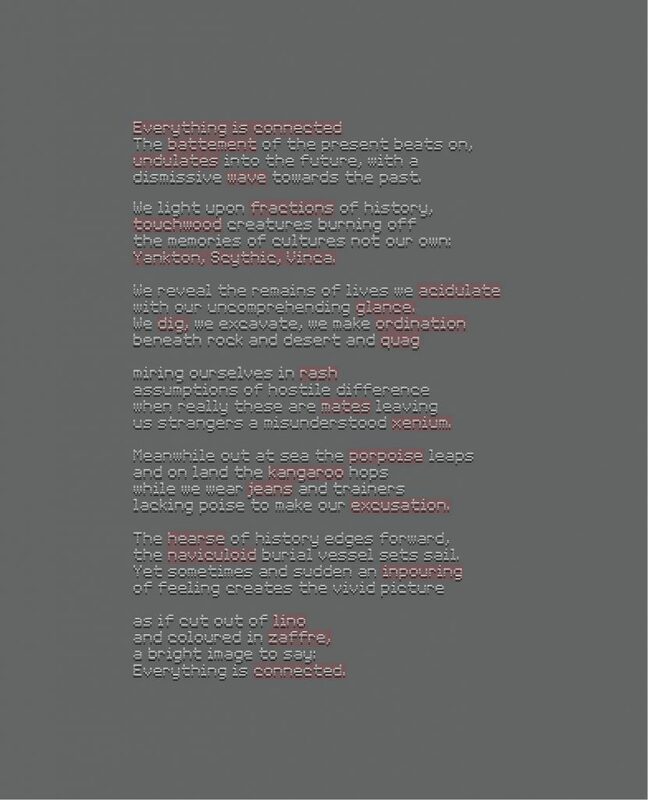 Superimposing the characters, they become a graphic language integrating form and function, in the process suggesting the meaning of the words, and the ‘connected theme’ of the poem. Connected – the character forms and the layered design joined, linked together. We agreed at BL, this word summed up the whole project; the links between the two organizations, and the various pairings. Battement – beating movement – the repetition of the grid pattern is the ‘graphic heartbeat’. The ‘movement’ words inpouring, undulate, wave are represented by the continuous horizontal lines that move you through the words. The context in which John enmeshes the words in poetic form has many other ‘movement’ words – leap, forwards, edges etc. The final layered design utilizes the letterforms to create ‘a web of connectivity’. An interesting offshoot in the creation of the poster – one of the layers shows as an abstract – the collective spirit of the words?